Indian Idols ranking 1st – Abhijeet Sawant, 3rd – Rahul Vaidya, 4th – Prajakta Shukre and 5th – Ravinder Ravi performed in this one night event. Preparations totalled a duration of 17 days from the first task to dismantling. This excludes minor pre-planning meetings and discussions. 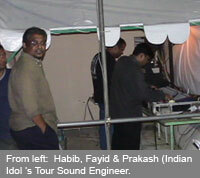 This project had a team of 15 members, mostly from Island Music which was headed by Hambe. Below is a screen copy of the actual project plan that was used. The sound was distributed to the Alimas Carnival audience area using a delay stack. A total of 11,600 Watts (continuous ) power was added as Stack 1, to the existing speaker stacks installed at the Carnival premises. Stack 2 (delayed stack) had a continuous power of approximately 16,000 Watts. The weather was very bad prior to the event which caused massive delays in sound checks and in other preparations. Proper planning paid off as the Master Sound was preliminary tuned in between storms, up a day before their arrival. Luckily it cleared up just for the event and went on smoothly until the encore at just about midnight when we had very heavy rain which prompted organizers to end the event.